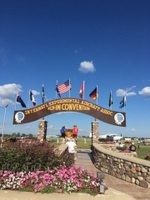 Check out the 2016 EAA AirVenture trip report, pictures, link to the 2016 AirVenture website, and the 32 page NOTAM for KOSH! 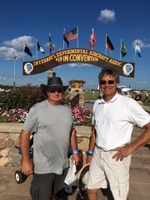 Denis Rottler and I made plans to fly the Archer to OSHKOSH (KOSH) this year for the 2016 EAA Airventure. Our adventure was met with multiple Plan B’s opportunities and each was a great learning experience in and of itself. This adventure actually began last year. 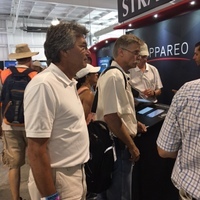 I was fortunate enough to attend the 2015 EAA Airventure as a right seat passenger. It was a great experience even in the “right seat”. I had been invited to ride along and share expenses in a Cessna 182 and a rented a house shared between thirteen friends from Gainesville. This year my Gainesville friends and I had decided to rent a house and return to Oshkosh again, but this time I wanted to “land on the dot” from the left seat. One by one, each of the previous year’s attendees dropped out, leaving only four people this year. Two friends from Gainesville, Denis Rottler (1st time) and I were the only ones that would be making the trip this year. My friends from Gainesville also informed us that they would not be flying this year but decided to drive. Obviously, we would not be able to rent a house with only the four of us, so we decided (Plan B) to stay in tents like most of the other guests. Denis and I meticulously planned and studied for our trip. Camping gear, NOTAMS, routes, fuel stops, weather, alternating PIC duties, etc. We even practiced our slow flight and landing on the simulated dots at Majors. Sunday morning, July 24th at 0800 we were airborne and enroute to Wisconsin. The first stop in Branson (KSGF) and the second stop in Davenport Iowa (KDVN) were fairly uneventful except in Davenport we met some float plane pilots that knew several of the same people we knew from Gainseville. What a small world. The third and last leg of our flight was planned to take us all the way to Oshkosh. As you may or may not know, almost all airplanes arriving in Oshkosh are required to navigate to the city of Ripon (southwest of KOSH) and begin to merge into a line with ½ mile spacing. The requirement is to be at 1800’ and 90 kts at Ripon and follow the railroad tracks for about 10 nm to the northeast to Fisk. At Fisk each airplane is asked not to respond on the radio, just follow instructions. Red & White Cessna, rock your wings…good rock…follow the RR tracks to 27. Blue low wing…rock your wings…turn right on the east-west road to 36L, etc. Each command was seemingly given as fast as one could talk. All incoming pilots were expected to understand and perform as directed in the thirty-two page NOTAMS. After being assigned a runway, each pilot was to tune to a new and separate frequency associated with their runway assignment. Upon nearing the runway, a new controller would then assign landing instructions (which colored DOT to land on). Sounds confusing and difficult but believe me when I tell you that these controllers really know what they are doing. And if you studied the NOTAMS, it really isn’t that difficult. As we were arriving to Ripon, we were in awe while intently listening to the traffic and controllers ahead of us, and anxiously waiting for our instructions. Suddenly the controllers announced (Plan B) “THE AIRPORT IS CLOSED, THE AIRPORT IS CLOSED”. All traffic was then advised to go the pre-designated holding areas. There had been a crash on runway 36L. We were advised that these types of incidences were normally not quick to resolve and we were given an option of continuing to hold or continue on to our Alternate Airport. We decided to continue to our alternate, Fond Du Lac (KFLD). Arrival procedures at KFLD were similar to KOSH (same listen only and color of airplane calls from the controllers and a similar flurry of calls – no colored dots though) so we were prepared and ready for the now busy arrival and landing at our new destination. We were to enter downwind for 27 and follow the T-6 to landing. All went well until (Plan B) we were on short final and to the best of my knowledge we were into the T-6’s wake turbulence (if that’s even possible?) The Archer rocked hard left and then right. We then executed a (Plan B) go-around and were then asked to re-enter the base leg and land long (at least mid-field) as we were followed closely by other airplanes. The landing on the Dot practice paid off, we landed at mid-field without any more complications. On the day of our departure, we were met with weather in the general vicinity and also along our route. We navigated (Plan B) around, over and under many types of weather with assistance from weather briefers, iPads, Stratus, flight following, other pilots during our fuel stops, and anything else we could think of. As we were approaching our final planned fuel stop in McAlester Regional (KMLC) in Oklahoma, we were confident that we would not be able to make it all the way to KMLC because of thunderstorms. Our alternate airport (Tahlequah – KTQH) was also experiencing thunderstorms in the area. We decided to land (Plan C) in Pittsburgh, Kansas at Atkinson (KPTS) where the weather was clear so we could reevaluate the weather rather than pushing on and getting in over our heads. Weather briefers we decided our best option would be to hangar the Archer and get a hotel for the night. Of course, the next morning we were surprised to hear that KGVT was now experiencing thunderstorms in the area. By this time we were growing accustomed to all the PLAN B’s. With a bit more weather dodging and some light rain on the windscreen, we touched down at Majors around 1000 on Thursday, July 28th. Be prepared for PLAN B and FLYING IS FUN! KSGF - Springfield-Branson Regional (Missouri) - nice FBO. Fuel discounted on the WEEKENDS and available during the week at a discount to EAA Members. The guy landing behind us was pretty nervous about us getting out of his way. The very calm controller urged him to continue his approach, "it will work out". After we were clear of the runway and headed up the taxiway in direction opposite of how we landed, we saw the big FedEx jet make his landing. Well done Mr. Controller. KDVN - Davenport Municipal (Iowa) - Another nice FBO with a courtesy car. We ate at the Machine Shed in town to let some of the weather at KOSH go by. Bread, coleslaw, and applesauce (actually more like apple pie filling) is served family style as a kind of an appetizer. Passed on trying cheese curds. One of the reasons we picked this airport was lower cost fuel (by a $1.00) than surrounding airports. We failed to notice that was the self service price and paid the highest fuel cost of the trip. Good planning, poor execution. KFLD - Fond du Lac Country (Wisconsin) - We ended up setting up camp here due to KOSH being closed upon our arrival. We parked the Archer in the grass as directed and pitched the tent behind the left wing. We were just off of Taxiway A on the eastern edge and just north of the 18/36 and 9/27 intersection. We wanted some ice to cool off our "water" but were without transportation. One of the workers offered us the keys to his truck and ended up driving us to get ice. A sign of good things to come for the week. We had an extra sack of ice and made fast friends with RV and his family by offering them the ice. The Care Flight helicopter base was about a 100 yards behind us and they only needed fuel and flights twice a night most nights. That jet that roared off 27 at 0528 Monday morning was only slightly unsettling. When the sun set on Sunday evening, there was about 20 airplanes parked in the grass. The four male and four female showers that were set up seemed like a reasonable number and they were less than 200 yards from our tent. 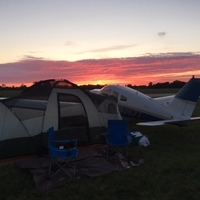 By the time we got back from Oshkosh on Monday night, there were at least 200 airplanes and tents parked all over the airport. Guess what? There were still only a total of 8 showers. Oshkosh stopped accepting GA campers by 1100 on Monday and at least part of the overflow was diverted to KFLD. Apparently Fond du Loc had never seen this may campers. It all worked out. There is not a lot of competition for a 0430 shower. The charge was $50 to camp for the week but the bus ride was $20 per day round-trip. It is just a 20 minute ride to KOSH and the cost of the bus ride seemed a bit steep. It actually was quite painless and ran pretty much on schedule. NOTE OF CAUTION: bring effective mosquito spray and be prepared to be in the tent at dusk. KMBY - Omar N Bradley (Missouri)- a small, old fashioned terminal with the cheapest self serve gas of the trip. They had a food trailer set up outside that made for a convenient and yummy pulled pork sandwich. Chatted with a young man and his Grandpa who were maintaining the place and mowing the property and with some pilots coming back from Oshkosh. One set was headed to Aero Country and the other to Paris. Great example of pilots helping pilots at this stop. The folks headed to Paris in their RV-10 heard us discussing the weather and told us to contact them on 123.45 MHz for a weather report. When we got airborne we were unsure about the tops and concerned about getting trapped on top. Fred in the RV-10 reported he was at 8500' with the tops at 6500' and he was right. We enjoyed a cool, smooth ride with a view on this leg thanks to Fred. KPTS - Atkinson Municipal (Kansas) -a very comfortable, old school terminal (cinder block walls) with some really nice folks. They were so friendly and helpful. We took the courtesy car to clear our heads and get something to eat and decided to stay the night. They gassed up the Archer, put it in the hangar, and had it out by the time we got there in the morning. They let us keep the courtesy car overnight and even offered to let us sleep in the FBO overnight. All of the Pitt State gorilla statues around town is a bit freaky but GO PITT. Swing by and say hello to Bill Pyle the airport manager the next time you are up that way. Is is not politically correct to ask about the "beads". On Thursday, June 23, 2016, the Majors Flying Club (MFC) participated in the Second Annual Commerce Kids day at the Commerce Municipal Airport (2F7). This time last year Mr. Tom Bailey contacted the MFC President Dennis Mathis and asked if the club would be interested in bringing a plane to the Commerce airport to support a program about airplanes and flying for the Boys and Girls Club of Commerce. The club agreed and a good time was had by the five kids who attended. Mr. Bailey contacted Dennis Mathis again this year about supporting a similar program. This year the kids would be from the Commerce Independent School District "A Step Ahead" summer reading program. The summer program is coordinated by Tina Bronson and the 3rd and 4th grade kids would be from the classes of Latisha Britton and Jessica Duckworth. Mr. Bailey is apparently a pretty fair salesman as the headcount grew from five kids last year to eighteen kids this year! Mr. Bailey provided in-class instruction to the kids focusing on the four forces (thrust, drag, lift, weight) and the control surfaces. Mrs. Bronson prepared a very nice workbook for the kids which included all the material presented by Mr. Bailey. It was a very well done workbook and seemed to be very effective. The kids were well prepared to talk about the four forces and the control surfaces. With a 1.5 hour window to talk with eighteen kids and show them an airplane, it was quickly decided that two planes would be a really good idea this year. Thankfully MFC member Don Reeder was more than happy to bring his Super Cub to the event. Don flew his Super Cub to Majors (KGVT) and joined up with Denis Rottler in the club Cessna 150. The flight of two departed KGVT around 0815 in order to ensure they would be in the area when the kids arrived by bus at 0845. A low pass was executed by each plane followed by full stop landings to give the kids a chance to witness airplanes in flight. The City of Commerce and Airport Manager Mike Whitler did a nice job supporting the effort with a nice place to talk with the kids and plenty of bottled water on hand. Don and Denis talked with the kids for a bit about the forces, the control surfaces, the differences between the Cessna and the Super Cub, and some other delightful banter. But really, the trip was all about touching and feeling airplanes so enough talking and off they went to the flight line. Both group of kids got to spend time at both the Cessna and the Super Cub and each kid got to sit in at least one of the airplanes to manipulate the controls. The gentlemen who gassed up his Cirrus at the self service pump had about as much fun as the rest of us. The kids gave him a big cheer when he started up his engine and taxied away. FUN STUFF. The kids were able to stay long enough to see both Don and Denis takeoff. Thanks to Mr. Bailey, the "A Step Ahead" program, and the Commerce Municipal airport for inviting the Majors Flying Club to participate in this event again this year. We are looking forward to our invitation to next year's event! The club hosted a cookout and chat session on Tuesday, June 21, 2016 for two former friends of the club. Several years ago, young Alex Curle was the chef at several of our events. He even sported chef garb at one of the occasions. He is quite a knowledgeable young man especially when it come to airplanes. Alex and his dad Ron participated in annuals and other events as well back in the day. They were in town and wanted to stop by and say hello. President Dennis Mathis organized the event and enlisted the grilling skills of Joe Rector and the stellar brownie baking skills of Gordon Hay. I suspect Alex may just have been a ploy to get Gordon to cook up a batch of those killer Ghiridelli brownies. Judging from the way the brats and hot dogs were gone in 20 minutes, I'd say the meeting yesterday was a great success! Many thanks to Joe Rector for a marvelous example of cooking expertise! Gordon Hay's brownies were a big hit as well. Alex Curle and his dad, Ron, were very appreciative of the many club members who came by to say hello. It helped a bit by Harry Andonian reciting some of his aviation experiences. He even took Alex to his aircraft to show his airplane. A good time was had by all. Thanks to all club members who showed up to meet and greet Alex and his dad. It was a good experience. The Majors Flying Club held a General Membership meeting on May 26, 2016 in Bay 1 of the flying club hangar. Chef Joe Rector was once again called on to grill up some burgers and brats to feed the masses. The grill was going strong by 4:30 p.m. and the masses were not disappointed. Thanks Joe for another round of tasty groceries. President Dennis Mathis called the meeting to order shortly after 5 p.m. and made some opening remarks. Tom Hubert was recognized for his Solo flight in the Cherokee 140 on May 4, 2016. Tom is getting course correction data from Don Reeder as they work toward Tom's Private Pilot Certificate. Mr. Mathis spoke for a few minutes on the subject of the FAA Wings program and pointed out the benefits and potential savings especially when preparing for a biannual flight review. Vice President Denis Rottler was introduced and spoke for several minutes on the status of the ADS-B Out project for the Archer. The existing configuration and two proposed solutions were presented. The goal is for a Fall 2016 installation of an ADS-B Out system for the Archer. Treasurer B.J. Finney was introduced and presented the state of the finances for the club. The club's finances are in pretty fair shape. The funds are available for the ADS-B Out system for the Archer, we have about 73% of the money saved for the Archer engine, and about 76% of the cost for the 2016 Annual insurance saved. With the business side of the meeting concluded the guest speaker, Harry Andonian was introduced. As most of you know Harry has quite a storied and famous aviation history both in the military and in civilian life. He always has something interesting to talk about and the information on his slides always amazes folks: he has flown 200+ airplanes and has over 27,000 hours in his logbook! Wow. As you can see from the pictures Harry started his aviation career as an Aviation Cadet in 1943 and served in a wide variety of military locations and assignments until 1971. Harry followed up his military career as an Engineering Test pilot for E-Systems from 1971 to 1988. Harry still flies his Debonair almost daily. Harry provided some background on his military career before talking about his X-15 exploits. Harry flew the B-52's that carried and launched the X-15's from its wing. Specifically he flew the B-52 called Ball 8 (0008) as part of the X-15 program. It just so happened that Don Reeder was at Edwards Air Force base a few weeks before Harry was going to speak and saw the static display of the Ball 8 airplane. One thing lead to another, and Don came up with the idea to present Harry with a framed set of pictures which included the Ball 8. You can see the presentation and a close up of the picture below. The only thing left was to get Harry to talk about the X-15 program and the B-52's which Dennis Mathis pulled off without a hitch. If was another very entertaining presentation by Harry and enjoyed by the 20+ folks in attendance. Thank you Harry! The final class of the 2016 Private Pilot Ground School was held on Tuesday, May 10th. After fifteen weeks of bad jokes, the dissemination of tons of information, the consumption of countless sacks of chips and cookies, and some good times, a hardy eleven souls received their Certificates of Completion. Congratulations to the class, they outlasted the instructors. The Majors Flying Club (MFC) President, Dennis Mathis, once again conducted and organized a well orchestrated Private Pilot Ground School. The MFC offers the class every year from February to May. This year Mr. Mathis was once again able to recruit some very experienced pilots and instructors to assist in teaching the classes. Many thanks to Mark Armstrong, Clarke Erwin, Clint Logwood, and Joe Rector for their help this year in the teaching effort. Mr. Mathis invited Dr. Robert D. Sparks of Sparks Clinic in Rockwall to speak on the last day of class. In addition to being an entertaining speaker, Dr. Sparks is an FAA certified Medical Examiner and a good local resource for those looking to get the physical required to obtain a medical certificate. As has become a tradition, Mr. Mark Armstrong was on hand to demonstrate his prowess with his impressive sword from his days at The Citadel. Mark busted a few moves with his sword before deftly slicing the graduation cake into twenty scrumptious morsels. It is an entertaining way to cut a cake. The evening ended with Mr. Mathis handing out of the Certificates of Completion and the requisite photo op with each of the students. As you can see from the photos below, there were ten very happy students and one student who was too cool for words. Congratulations to the Private Pilot Ground School students of 2016! Majors Flying Club (MFC) President Dennis Mathis, organized and coordinated a lunch celebration of the 92nd birthday for our friend and local hero, Harry Andonian on Thursday, February 11, 2016 at the Chili's restaurant in Greenville, TX. The event was attended by twenty-six people. The pictures show an engaged and a somewhat vociferous and opinionated bunch of folks sitting around celebrating with Harry. As Mr. Mathis said, "A BIG thank you for all of you who were able to attend the informal gathering at Chili's today (Thursday, 11 Feb ) to help celebrate Harry Andonian's 92nd birthday. It was quite an event. I think Harry was honored by the 26 of us who showed up for this. Of course, the honor is really ours to be able to say we sat and dined with a legend. My thanks to Dave Claud, the Chili's manager, and Sara Lopez, the waitperson, who attended to our little function and made it the success it was." The first class of the 2016 Private Pilot Ground School was held on Tuesday, February 2, 2016 in the McCullough Room of the Rec Center at the L-3 facility in Greenville, TX. The class will meet every Tuesday from 1800 - 2100 for the next 14 weeks. The Private Pilot Ground school has been offered annually by the Majors Flying Club (MFC) for the past 10 years. It has proved to be a very well attended and successful event due in no small part to the organization of the material presented in class as well as the depth and breadth of the knowledge and experience of the instructors. It is one thing to sit down and read the Private Pilot Handbook and a completely different experience to sit in the classroom and enjoy the benefit of the material being presented by instructors with real world knowledge on the subjects being presented and who have a ton of flying experience (i.e. - lots of cool stories). Sixteen fresh faces with a lust for knowledge (or some spare pocket change and a bunch of spare time) showed up ready to drink from the fire hose tonight. The MFC President and organizer of the MFC Private Pilot Ground school, Mr. Dennis Mathis welcomed the students, made some introductory remarks, and introduced the instructors that were present. Each of the instructors, including Mr. Mathis, gave the class a bit of background on themselves and their experience as it relates to flying. The instructors present were Clarke Erwin, Joe Rector, and Clint Logwood. Mark Armstrong will introduce himself to the class when he teaches his module. As you can see from the pictures, it looks like the class is in full swing. The name tags for the desks have been created, lots of course material is laying around, nobody is paying attention to the instructor, and a nice selection of snacks is available as well as copious amounts of coffee. Except for the two clowns in the back right, everyone else looks like they belong in the class. Graduation is just 13 weeks away! The first Majors Flying Club general membership meeting of the year was held on Thursday, January 28, 2016 in the clubhouse. Pizza was provided and available at 1645. Gordon Hay supplied his own version of a very delectable batch of killer Ghiardelli brownies for dessert. They were cut into very generous portions and everyone was up to the challenge. The Regular Members portion of the meeting for the purpose of conducting the annual elections was convened around 1715. Kurt Muller graciously conducted and oversaw the election process. The list of nominees (Mark Armstrong, BJ Finney, Dennis Harwell, Don Van Kleek, Dennis Mathis, and Denis Rottler) was presented by Kurt. The floor was opened for nominations and none were proposed. The election was held to vote for the nominees and all the listed nominees were elected by unanimous vote. Thank you Kurt. With the election process concluded the meeting was opened up to the rest of the membership and guests. The first order of business was to congratulate the newest member of the pilot community, Bryan Hamel. 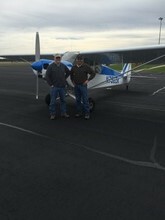 Under Dennis Mathis' tutelage Bryan successfully completed his check ride on January 13, 2016. Congratulations and welcome to Mr. Hamel. The President, Dennis Mathis spoke for several minutes regarding the status of several projects. The Cessna is progressing nicely toward the completion of its annual inspection. The project this year included the replacement of the engine with an overhauled engine from Custom Aeromotive. The removal of the engine uncovered several other items that needed to be addressed (LH muffler shroud, spinner bulkhead, RH muffler, and mixture control cable) as well as planned items such as new hoses, new starter, new engine mounts, getting the propeller cleaned up, and the radio repaired. Mr. Zimmerman has been a particularly busy man during this annual. The annual for the Archer is scheduled to start on March 6, 2016. No major upgrades are planned but flap and aileron seals as well as an STC'd dimmer circuit for the panel and radio lighting will be added during the annual. The electric trim switch will be removed and evaluated but it is unlikely to be a repairable item and due to the cost it is unlikely to be replaced if not repairable. The Avionics Upgrade account that was created to begin saving money to support the 2020 ADS-B Out mandate was discussed. There are several viable options available to the club based on the planned budget but there is still quite a bit of discussion regarding the best way for the club to proceed. The board is looking to Kacey Dudenhoeffer for guidance and technical expertise to help us evaluate the offerings and guide our decision. The near term goal is to select a system early this year potentially with a portion of the system installed in the Archer later this year. At the conclusion of the business portion of the meeting, the President, Mr. Dennis Mathis introduced the mystery guest speaker, Mr. Dennis Mathis. They could be brothers. Mr. Mathis presented a very interesting Part One of his military career. Although he is known as a pilot, that is not how his career with the Air Force began. Like most folks, he trained at a variety of bases early in his career but by the time we got to the end of Part One he was the Defensive System Operator in the Air Force's first operational supersonic bomber capable of Mach 2 flight, the Convair B-58 Hustler. What an awesome looking delta wing bomber. Mr. Mathis is apparently a quick learner and quickly discovered it is not a good idea to touch the structure to see how hot it gets in supersonic flight. We are looking forward to the rest of the story, including his transition to becoming a pilot, at a future date hopefully sooner rather than later. 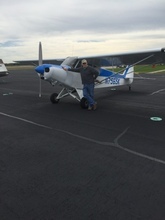 On Saturday, November 14, 2015 the Majors Flying Club hosted its Fall Rallye. The event was planned and coordinated by the President, Mr. Dennis Mathis with the help of several volunteers. The event was well attended by about twenty people which included the pilots and crew members from the four aircraft entered in the contest. The day started around 0730 with a hangar breakfast that included Grand's Southern style biscuits, sausage gravy, Jimmy Dean's sausage patties, Cracker Barrel hash brown casserole, donuts, and orange juice. While the pilots, navigators, and other interested parties enjoyed breakfast, the President and his staff of volunteers were scrambling around in the background to overcome some last minute changes to the Rallye. The briefing was presented by Mr. Mathis and started at 0900. 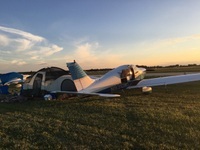 The briefing included the tasks to be performed departing KGVT (soft field takeoff over a 50' obstacle), the initial destination (Mineola-Wisner - 3F9), the check-in points, approach (360 degree simulated engine out approach and landing), and the touchdown point for 3F9. Additionally an extensive list of rule infractions and penalty points was presented. There was a bit of discussion between the pilots and the briefer until all were satisfied. Instruction for the subsequent destinations would be received at Mineola-Wisner. The first aircraft departed KGVT at 093130 followed by the other three aircraft in a well spaced and tightly controlled sequence. The instructions at Mineola-Wisner made Terrell (KTRL) the second destination with a short field landing and the touchdown point at the numbers. The leg out of KTRL was short field takeoff and a trip back to KGVT with a touchdown point for a runway 17 landing at the intersection of the closed NW-SE runway. A total of about 100 nm was flown for the three legs and took just over 2 hours to complete all three legs. It is always good to make it back to home base but it was an especially good sight on Saturday to taxi up and see the grill being fired up by Joe Rector with the promise of hamburgers, hot dogs, and brats. Along with a full tray of trimmings, there was potato salad, chips, brownies and cookies. Who knew a Rallye would work up such an appetite! The points were totaled and the winners were announced. Mr. Buddy Crump, the Aviation General Manager for the airport, was on hand to represent the city and pass out some very nice prizes. The prizes included 20 gallons of 100LL, a Carbon Monoxide detector, and several gifts cards to places such as Sporty's, Chili's, and Walmart. Pilot Dale Crumption in his Centurion (N6557B) with an assist from all three of his grandsons. They may have had the most fun as they switched out the co-pilot spot on each leg. 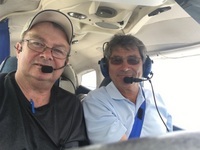 Pilot Don Van Kleek in the club's Archer (N8367T) and his intrepid navigator and club Safety Officer, Mark Armstrong. 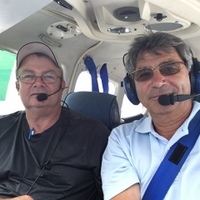 Pilot Dennis Harwell in the trusty club Cessna (N19481) introducing Craig Wheeler to the joys of flying. The good news is everybody finished in the Top 5. It was a very fun event in terms of flying, navigating, and some friendly competition but as Don Reeder said, it was really the Fellowship before, during and after the event that made the day. Many thanks to the City of Greenville and Mr. Buddy Crump for providing some very nice prizes and helping promote the event. Many thanks to Mr. Mathis who coordinated and organized the event and to the judges (Jon Bottorff, Ian Horbaczewski, Dennis Mathis, and Tom Trower) who gave up a good portion of their day to help with the judging. Thanks also to Lupita and her crew at Mineola_Wisner for setting up the touchdown point markers, judging the landings, and passing on the instruction for the subsequent leg. We held our Spring General Membership Club Meeting in the Club Hangar on Thursday, May 28, 2015. The featured speaker was Harry Andonian. The event was attended by around twenty people. The Club provided queso, pulled pork sandwiches, bratwurst, potato salad, walnut brownies, and oatmeal chocolate chip cookies for consumption by the attendees. The Business Meeting was convened at 1700 for the Regular Members to consider and vote on BJ Finney as Treasurer. The current treasurer, Joe Wiser, recently changed to an Associate Member and as such is no longer eligible to be a board member. After much discussion and a hotly contested nomination process, Mr. Finney was voted in as the Treasurer of the Majors Flying Club. Thanks to BJ for stepping up and a huge thanks to Joe Wiser for his detailed and organized reporting system of the club finances. Joe's monthly reports, as well as his quarterly reports to the E-Club, are easy to read, detailed, and nicely formatted. Thank you Joe. The President, Dennis Mathis, kicked off the General Meeting around 1730. Dennis announced the new Treasurer, touched on the FAA Wings program, and mentioned the clubs progress on saving money toward the implementation of ADS-B for the Archer. The two members of the 2015 Ground Class who were not able to attend the graduation ceremony were presented their graduation certificates by Harry and Dennis. Congratulations to Brandon and William. Dennis next introduced the well known and always entertaining Harry Andonian. Harry scrolled through several slides detailing his 200+ airplanes flown, talked about his struggles to get into the Armed Services as an aviator, his solo flight (including a dashing picture of Harry on that special day), the Vomit Comet, U2 flameouts, bombing Florida, and blacking out a city and causing car crashes on the highway. Always entertaining, always new stories. Great stuff. Thank you Harry. Mr. Mathis presented Harry with the standard Majors Flying Club coffee mug but this one had a twist. The cup has that dashing picture of Harry on the day he soloed and the date he soloed. It is a very cool coffee mug. You can almost see the picture under Harry's fingers in the picture where Harry is holding the mug. Nicely done Mr. Mathis. The meeting was adjourned around 1850. Many thanks to the members who stayed around and helped put away chairs and clean up the place. It was much appreciated.